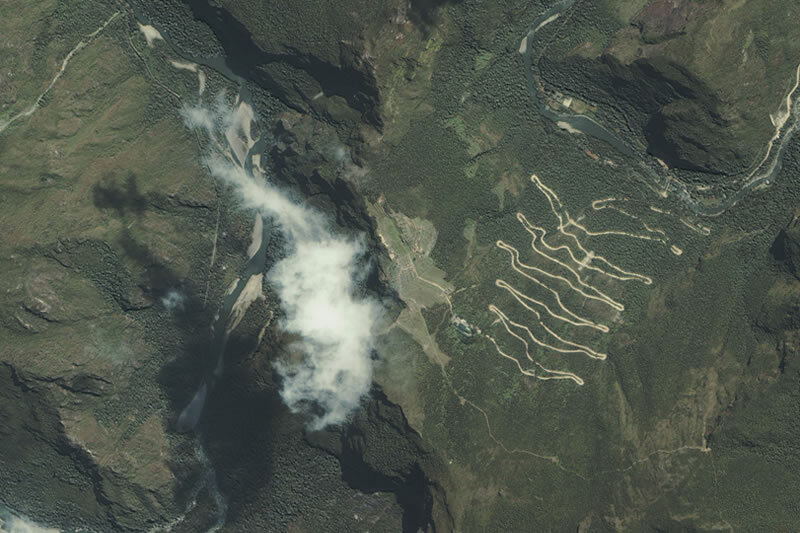 Although we can have a magnificent aerial view of the City of Machu Picchu, from the top of Huayna Picchu, there are things you can only do with current technology, through this satellite image we can see the perspective the creation of Inca engineers who worked exclusively for the sight of their gods, where the perimeter of the capital of the Inca Empire, forms the silhouette of the largest bird that inhabits the Andes, the condor. The main gods for the Inca civilization, were the sun, moon, stars and animals as the condor, the puma and the snake. It is already pretty amazing, like a stone city of such proportions on top of an inaccessible mountain was built, without having discovered the wheel and without the means of construction and observation, with which we have now. The architect Enrique Guzman, more than 20 years ago, bought a small scale replica of Machu Picchu in the National Museum. What he could see at that time, marked the research would start years later: “Inca City was shaped bird“. Thus began a simple inquiry that then will sustain in his master’s thesis for the National University of Engineering (UNI). I was fascinated by the way in which this city is rooted Inca mountain of Machu Picchu in the Vilcanota Valley. Give out a point of archaeological or historical, gave a view from space architecture, and the volumetric occupation. He found what he imagined for years, the original perimeter of the Inca city of Machu Picchu, was shaped like a bird, apparently flying towards to the Uña Huayna Picchu. Guzman argues that the disposition structures, streets and squares views in a global form towards this hill. In the Inca Cosmology there are major apus and minor apus, who talk among themselves. Therefore, the City is facing the Uña Huayna Picchu, and this in turn is in line with the Salkantay, the elder apu. all cities are built with a point at which they are targeted and in the case of Machu Picchu, was built towards the Uña Huayna Picchu. But the architect mentions a different interpretation of the origin of the name of the city. According to him, Machu Picchu no means “old mountain” but rather “old bird“. He says the word “Picchu” would come from the Quechua “Pichiu” which means bird or poultry, for this is based on the book of Grammar and Art the general language of Peru, of Fray Diego González Holguín 1607. This relation between Machu Picchu and its structures, has also been studied by the American researcher Johan Reinhard. He argues that Machu Picchu is located just south of Mount Salkantay, but you can not spot it from the Inca City. Both Reinhard like Guzman believe that the hills surrounding the city Inca, talk with the Apu Salkantay. Guzmán also postulated that the Incas, had wanted to give the shape of animals to other cities (as part of their worldview). He analyzed another city built by Pachacutec, Ollantaytambo. Which general disposition of buildings, spaces and platforms also have the shape of a bird, also it ensures that the bird was one of the favorite animals of the Inca. Not only Machu Picchu is shaped like a sacred animal to the Incas, a view from space, we would see that the Archaeological Capital of America and Navel of the World Cusco, has the form of a silhouette in Puma. The reason for the forms that had given them have always intrigued researchers. In the early 60s, archaeologists Manuel Chavez Ballon and John Rowe, they said the city of Cusco was in the shape of a puma crouched in attack. Idea supported, years later, the historian Maria Rostworowski. But are not the only ones; in Peru are amazing views from the sky, like the “Nazca Lines” that seem to be made by aliens, the question is how they did it?, these images without satellites or anything like that; seems to be works of people who dominated the gravity?. So far no one has a clear idea of how the silhouettes of these animals were in such inaccessible areas like Machu Picchu Mountain, without the help of satellite views or other technology that would allow them to see from the sky and large scale.